Beacon Hill Park is the central city’s main urban green space. Its area of 75 hectares (190 acres) adjacent to Victoria’s southern shore includes numerous playing fields, manicured gardens, exotic species of plants and animals such as wild peacocks, a petting zoo, and views of the Strait of Juan de Fuca and the Olympic Mountains in Washington across it. The sport of cricket has been played in Beacon Hill Park since the mid-19th century. Each summer, the City of Victoria presents dozens of concerts at the Cameron Band Shell in Beacon Hill Park. The extensive system of parks in Victoria also includes a few areas of natural Garry oak meadow habitat, an increasingly scarce ecosystem that once dominated the region. In the heart of downtown are the British Columbia Parliament Buildings, The Empress Hotel, Victoria Police Department Station Museum, the gothic Christ Church Cathedral, and the Royal British Columbia Museum/IMAX National Geographic Theatre, with large exhibits on local Aboriginal peoples, natural history, and modern history, along with travelling international exhibits. 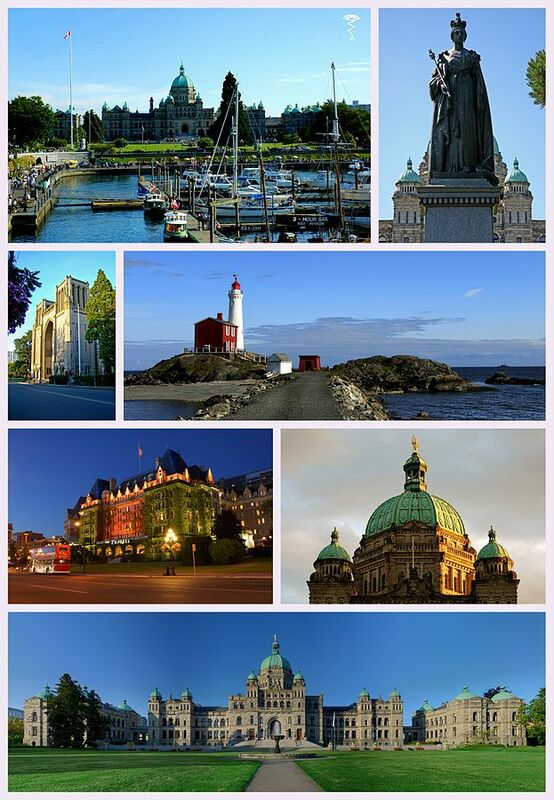 In addition, the heart of downtown also has the Emily Carr House, Victoria Bug Zoo, Market Square and the Pacific Undersea Gardens, which showcases marine life of British Columbia. The oldest (and most intact) Chinatown in Canada is located within downtown. The Art Gallery of Greater Victoria is located close to downtown in the Rockland neighbourhood several city blocks from Craigdarroch Castle built by industrialist Robert Dunsmuir and Government House, the official residence of the Lieutenant-Governor of British Columbia. 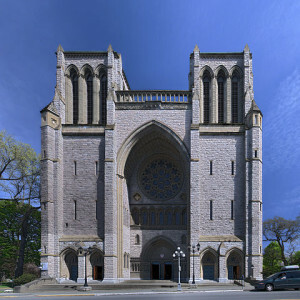 Numerous other buildings of historic importance or interest are also located in central Victoria, including: the 1845 St. Ann’s Schoolhouse; the 1852 Helmcken House built for Victoria’s first doctor; the 1863 Temple Emanuel, the oldest synagogue in continuous use in Canada; the 1865 Angela College built as Victoria’s first Anglican Collegiate School for Girls, now housing retired nuns of the Sisters of St. Ann; the 1871 St. Ann’s Academy built as a Catholic school; the 1874 Church of Our Lord, built to house a breakaway congregation from the Anglican Christ Church cathedral; the 1890 St. Andrew’s Presbyterian Church; the 1890 Metropolitan Methodist Church (now the Victoria Conservatory of Music),  which is publicly open for faculty, student, and guest performances, also acts as Camosun College Music Department; the 1892 St. Andrew’s Cathedral; and the 1925 Crystal Gardens, originally a saltwater swimming pool, restored as a conservatory and most recently a tourist attraction called the B.C. Experience, which closed down in 2006. Attractions outside the City of Victoria CFB Esquimalt navy base, in the adjacent municipality of Esquimalt, has a base museum dedicated to naval and military history, located in the Naden part of the base. North of the city on the Saanich Peninsula are the marine biology Shaw Ocean Discovery Centre, Butchart Gardens, one of the biggest tourist and local resident attractions on Vancouver Island, as well as the Dominion Astrophysical Observatory, part of the National Research Council of Canada, Victoria Butterfly Gardens and Centre of the Universe planetarium. Notable museums in Victoria include the Royal British Columbia Museum,the Maritime Museum of British Columbia and the British Columbia Aviation Museum located on the north edge of the Victoria International Airport. There are also numerous National Historic Sites in close proximity to Victoria, such as the Fisgard Lighthouse, Craigflower Manor and Schoolhouse, Hatley Castle and Hatley Park and Fort Rodd Hill, which is a coastal artillery fort built in the late 1890s, located west of the city in Colwood. Also located west of the city is Western Speedway, a 640-metre (4⁄10 mi) oval vehicular race track and the largest in Western Canada. Athletes Victoria has been home to many accomplished athletes in its history. Notable professional athletes include Steve Nash, twice Most Valuable Player in the National Basketball Association, who grew up in Victoria and played youth basketball at St. Michael’s University School and Mount Douglas Secondary School. Furthermore, there are several current NHL hockey players from Greater Victoria, including brothers Jamie Benn and Jordie Benn of the Dallas Stars, and Matt Irwin of the San Jose Sharks. Michael Saunders, current outfielder for the Toronto Blue Jays was born in Victoria and still lives there during the off season. Professional racing cyclist and 2012 Giro d’Italia winner, Ryder Hesjedal was born in Victoria and still calls the city home. Victoria has also been home to numerous Olympic Games athletes, including, but not limited to, medallists such as Silken Laumann, Ryan Cochrane, and Simon Whitfield. Events Victoria has also been a destination for numerous high-profile international sporting events. In 1994, Victoria hosted the 1994 Commonwealth Games. 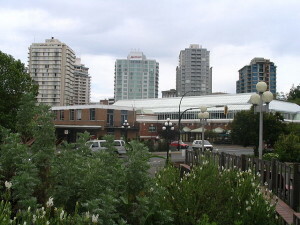 Victoria also hosted the 2005 Ford World Men’s Curling Championship. The 2007 FIFA U-20 World Cup was co-hosted by Victoria along with five other Canadian cities; (Burnaby, Toronto, Edmonton, Ottawa, Montreal). Victoria was also the first city location of the cross Canada 2010 Winter Olympics torch relay that occurred before the start of the 2010 Winter Olympics. Team History The city has also been home to numerous high-profile sports teams in its history. The Victoria Cougars are perhaps the most famous sports franchise the city has known, winning the Stanley Cup as members of the PCHA in 1925. The team then moved to Detroit under the name of the Detroit Cougars before the team changed its name to the current Detroit Red Wings of the NHL. Today a Junior ‘B’ team of that name plays in the Vancouver Island Junior Hockey League. From 1971 until 1994 there was also a team called the Victoria Cougars in the Western Hockey League, before they moved to Prince George to become the Prince George Cougars. Victoria was also once home of the Victoria Athletics of the Western International League, a Class ‘A’ minor league baseball affiliate of the New York Yankees. National Headquarters The Greater Victoria area also serves as a headquarters for Rugby Canada, based out of Westhills Stadium in Langford, as well as a headquarters for Rowing Canada, based out of Victoria City Rowing Club at Elk Lake. Motorsports Aside from field or arena sports, Greater Victoria also has a rich motorsports history, and is home to a 4/10ths mile oval race track called Western Speedway. Opened in 1954, Western Speedway is the oldest speedway in western Canada, and features stock car racing, drag racing, demolition derbies and other events. Hall of Fame The Greater Victoria Sports Hall of Fame is located at the Save-on-Foods Memorial Centre, and features numerous displays and information on the sporting history of the city.